Dubai our Sandbox: Another cupcake - but a good one! There is something sweet and vintage about this all American favorite. I love the cute individual size, and the fact that they are so personalized. We all have our favorite, some people like one kind of cupcake, some like another and they can be dressed-up to suit every occasion. I thought macarons would be the new cupcake; however, the French treat is too difficult to make and probably won't go completely mainstream. Maybe cake pops are the new trend?! Yesterday, I got to try Airy Fairy delicious cupcakes at a birthday party. What a treat, buttery and flavorful! There is a large selection of interesting flavors and toppings. 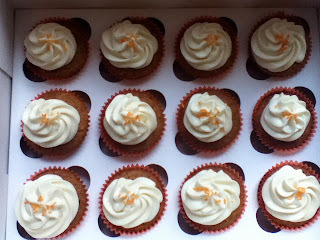 You can also request cupcakes free from- nuts, gluten, eggs and dairy! Looking for more sweets treats to order check out the cake pops, homemade marshmallows and fudge. Every order is made fresh on the day of purchase. Closed Fridays.